Chrome disc rear rotor to hub screw and nut kit, Allen screws and locknuts. Thread pitch is 3/8" X 16 X 1-1/2". 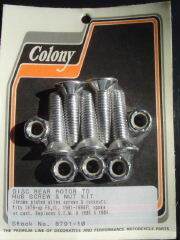 Fits 1979-up, FX, XL, 1981-1984 FL spoke or cast. Replaces OEM #'s 1605 and 1604.